When will be Tanked next episode air date? Is Tanked renewed or cancelled? Where to countdown Tanked air dates? Is Tanked worth watching? Following the antics of two brothers-in-law as they run the largest aquarium manufacturing company in the nation, Tanked dunks viewers into the high-decibel, family-owned business of Acrylic Tank Manufacturing (ATM). Led by business partners, best friends and rivals Wayde King and Brett Raymer and housed in a state-of-the-art, cavernous facility located in the center of Sin City, ATM has created thousands of enormous, conceptual aquariums for high-profile clients. 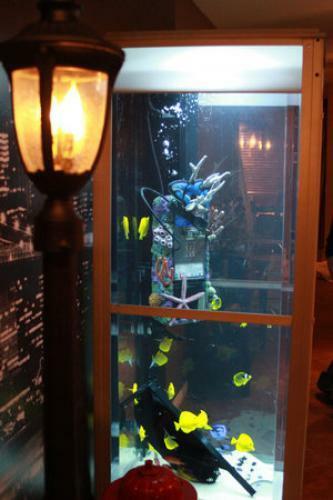 Working with opinionated and outrageous family and staff, the duo takes on jaw-dropping aquarium builds from such intricate and interesting locations as inside restaurants, casinos, bank, hotels, churches, offices, mansions, museums and zoos. Their tanks are for celebrities and ordinary Joes, and their aquariums and their business are filled with the most unusual and larger-than-life creatures in the world. Howie Mandel contacts ATM to build a tank for his production office. The comedian and television host has difficulty making up his mind so Wayde and Brett must design a tank without any guidance. A call from NBA star Dwight Howard sends Brett and Wayde to Houston. But Howard doesn't just want a fish tank, he also wants a new habitat for his two snakes! Standup comedian Gabriel "Fluffy" Iglesias wants ATM to build him a tank for his newly remodeled office. Wayde and Brett attempt to combine Gabriel's love of vintage buses into a unique pair of tanks, but a grand theft heist at ATM may put on the brakes. Renowned NFL Running Back and Super Bowl Champion Marshawn Lynch enlists Brett and Wayde to build him the ultimate Beastmode Tank! Ventriloquist Jeff Dunham wants a theater-themed tank starring his characters Peanut, Walter and Achmed! The addition of a submerged chandelier gets challenging when Jeff insists it light up! ATM is buzzing after news that International Mega-star David Hasselhoff wants a tank. As an avid diver David would love a Shark tank in his home, but after an inspirational visit to the Aquarium of the Pacific, they get some bad news. Wayde and Brett drop in on world famous magicians, Penn and Teller who want a tank built in honor of their 40th anniversary together. This double-sided tank will reside in their quirky backstage Monkey Room. Famous TV host and actress Sherri Shepherd reaches out to Wayde and Brett to build her a simple but elegant tank for her home. While that's underway, a company named Rugged Ridge has the rest of the shop sweating over their most outrageous build ever. Renowned comedian Bill Engvall requests a Zen-like fish tank for his new office in Hollywoo but some firm weight restrictions throw a wrench in their plans. In Vegas, the guys build a tank with fish, lizards and even insects for the home of Penn Jillette. Grammy nominated rock star and former Guns N' Roses guitarist, DJ Ashba shows up at ATM and asks Brett and Wayde to build him a creepy skull themed aquarium. Brett and Wayde must design and build a custom tank inside an old fireplace for the founder of famed R&B group BOYZ II MEN. In North Carolina they build a huge octopus exhibit for the Greensboro Science Center. NBA All-Star John Wall asks ATM to build an aquarium shaped like a giant pair of dice. In Georgia they build a huge lighthouse aquarium for a local seafood restaurant that includes engraved dolphins. Chicago Bull's star Jimmy Butler calls Wayde and Brett to build him an old school Boombox aquarium that lights up AND plays music. But a tricky entryway throws a wrench in their plans. Oakland Raiders' Donald Penn is in serious need of a custom insert. ATM gets a surprise call from their favorite customer, Shaquille O'Neal. The Retired NBA Super Star loves his first tank and is back for a second! Incorporating his love of Hookah and an Egyptian theme the guys build a tank fit for a Pharaoh. ATM rings in the holiday season as Wayde and Brett each try to out build one another in the world's first ever Tank Off! The competition between then heats up as Jackass creator Jeff Tremaine returns to judge who built the most badass tank! Tanked next episode air date provides TVMaze for you. EpisoDate.com is your TV show guide to Countdown Tanked Episode Air Dates and to stay in touch with Tanked next episode Air Date and your others favorite TV Shows. Add the shows you like to a "Watchlist" and let the site take it from there.